Elecom's New DATA clip Flash Drives Seem Oddly Familiar… | OhGizmo! By Andrew Liszewski on 08/02/11 • Leave a comment! You know I can’t seem to put my finger on it, but Elecom’s new DATA clip USB flash drives look oddly familiar to me. 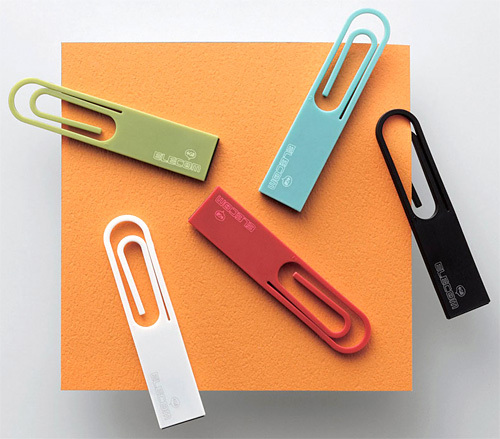 Their design awkwardly combines a USB flash drive with a traditional, curved metal paperclip. (Except plastic is the material of choice here.) And I say ‘awkwardly’ because when attached to a stack of documents the drive part ends up sticking out, which to me looks like it could easily be knocked off when passed around. A more improved design would have the DATA clip attached to a document so that the flash drive part hung over the page, making it more secure. But who knows, maybe that’s not even possible?